Since I have posted pictures of the rest of my birthday stash, I thought I'd better post a pic of my present from SJ. I used to have a large white vase in the same location as the pic, but it was too big for most of the flowers I'd buy and really needed extra long stemmed roses to look any good...and who can afford them as weekly flowers? So I had decided to shift the vase to a spot elsewhere on the floor and put stick things in it or something. 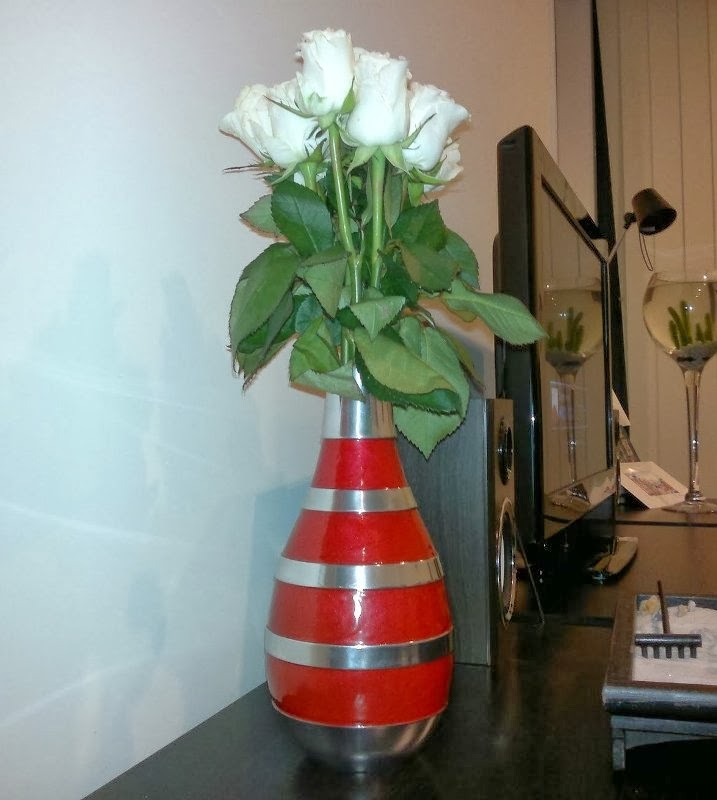 I was going to put some art in the spot (once I find a frame) but SJ bought me a new vase instead :-) He gave it to me on the Friday night before we left, with a note in the card saying the rest of the present would come on Monday 'for practical reasons'. He bought the roses on Monday. SJ's parents aren't bugging me so much today, they are starting to wear him down though. He hasn't lived at home in ten years and visiting has always had space to hide in. Our apartment is too small for hiding spaces and his parents don't have a lot to do at night here. So he feels like they're always in the way.